"light does affect physical and psychological wellbeing"
Nowadays Light stimulation is commonly used. The power of the electromagnetic spectrum is recognized and rediscovered. 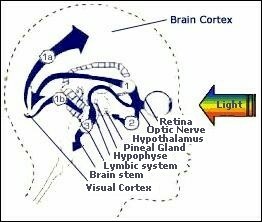 Especially that part that we perceive as visible light, is absolutely necessary for normal brain functioning. What is the connection between the influence of LIGHT and the proper functioning of the autonomic nervous system? What is the origin of 'lack of light'? Generally: Mall-illumination: too little sunlight, too much artificial lighting. The Detox program: The Photonwave Detoxification program of heavy metals, based on Dr Klinghardt’s protocol, is considered to be one of the most effective and fastest methods to help the body get rid of mercury, nickel, aluminium, cadmium etc. Allergies, fungi: Candida Program – The allergy program presents a unique way of dealing with allergies of all kind. The ADHD and ADD program is for children and parents the quickest method ever heard of to get their lives in balance without stressful exercises. Traumatic and emotional experiences are being resolved without too painful memories and a new future can begin. Photonwave Light Therapy is NOT intended for medical use or for use in the diagnosis or treatment of any mental health of physical condition. The device/therapy is not to be used as a substitute for medical help. Please consult a licensed medical professional for physical or psychological problems.